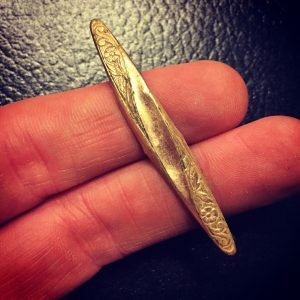 I’m blessed to share so many of my metal detecting experiences with the person I consider to be my best friend. We both caught the detecting fever and decided to pursue the hobby at the same exact time – unbeknownst to each other. While that will make a great story for another day, I’ll now tell you about one of our most recent adventures. James, my aforementioned best friend, told me he had gained permission at a horse farm. It was a few acres of pasture that dated back to at least the 18th century. While we didn’t know much of its history beyond its age and the fact that it was in an old area of New Jersey, “18th century” is enough for us to get excited. We both planned a vacation day and anxiously waited for it to arrive so that we could see what this farm might be holding. It just so happened New Jersey and the rest of the east coast was experiencing torrential rain for what seemed like weeks. Since we are all-weather detectorists, we prepared for the worst and made sure we had all our rain gear. The property owner warned us that most of the property was flooded, but that the perimeters were accessible. We were game. The day of, it only rained for periods, and not too heavily. But the ground was saturated. 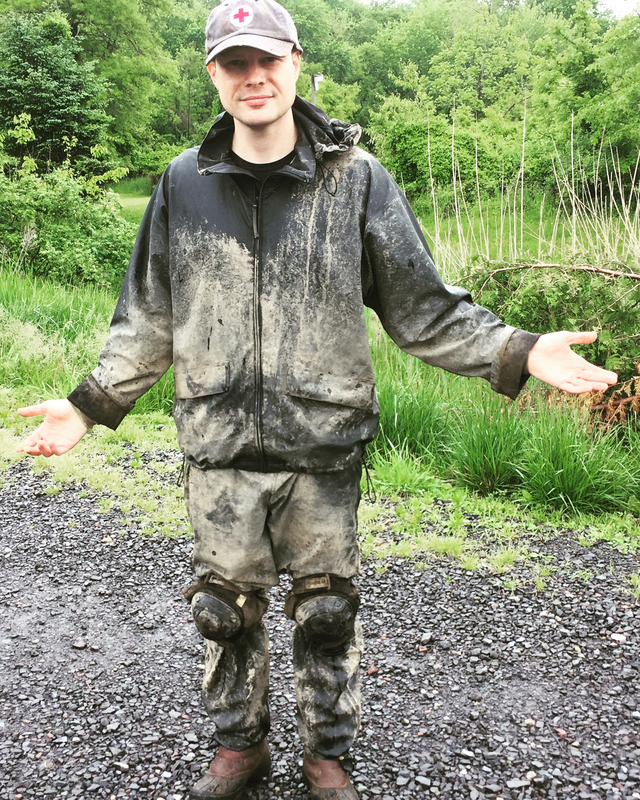 We quickly realized that we weren’t mucking around and sliding around in just mud – this was a horse farm after all. We did our best to stick to the high spots, knowing that about 80% of the property would have to wait for another day. Conditions were tolerable since the XP Deus is so light; therefore, caked-on mud (and other stuff) didn’t really weigh me down. 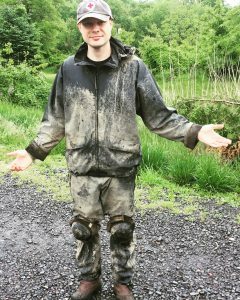 Grant covered in mud and, well, it was a horse farm. Finds came slowly. 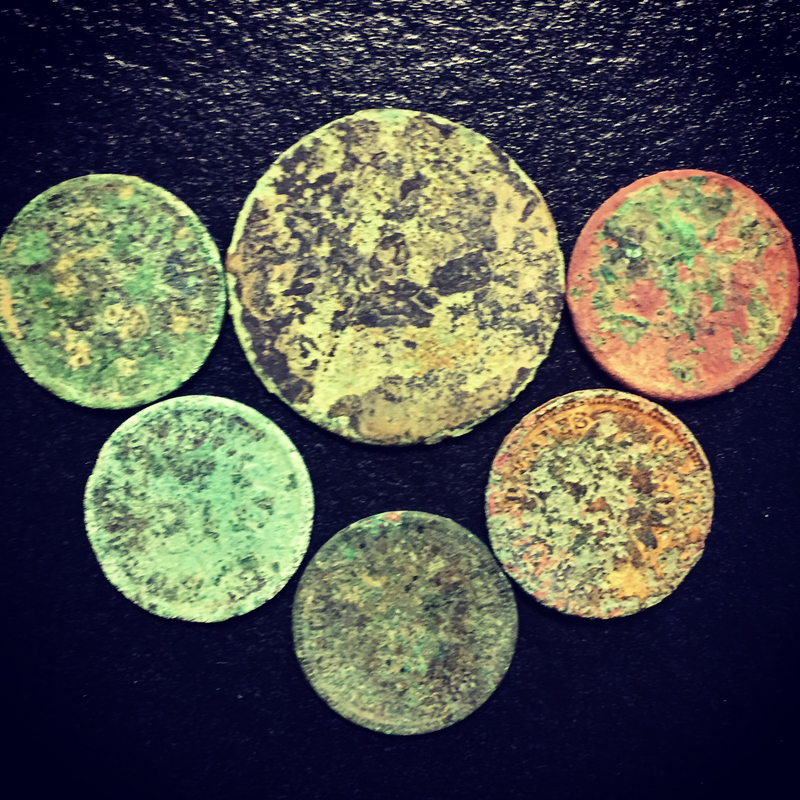 The first area we focused on didn’t yield much more than modern garbage, until I found an Indian Head penny, and shortly after a gold-plated hair clip. Since it was mostly quiet we worked our way to another field. There we started to find flat buttons, so we started to get excited. The problem was we just couldn’t access most areas… it was so muddy and manure ridden that we’d risk losing our boots. King George II half penny with 5 Indian Head pennies. We stuck it out, finding a few more buttons. Toward the end of the day I got a great high signal on my Deus and dug optimistically. It was deep! 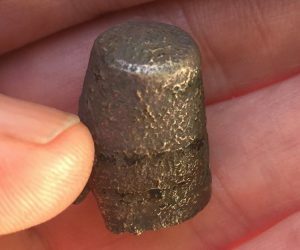 When I finally retrieved the target, I was delighted to see a round copper disc. “Colonial!” I shouted. James came running over to share in my excitement. 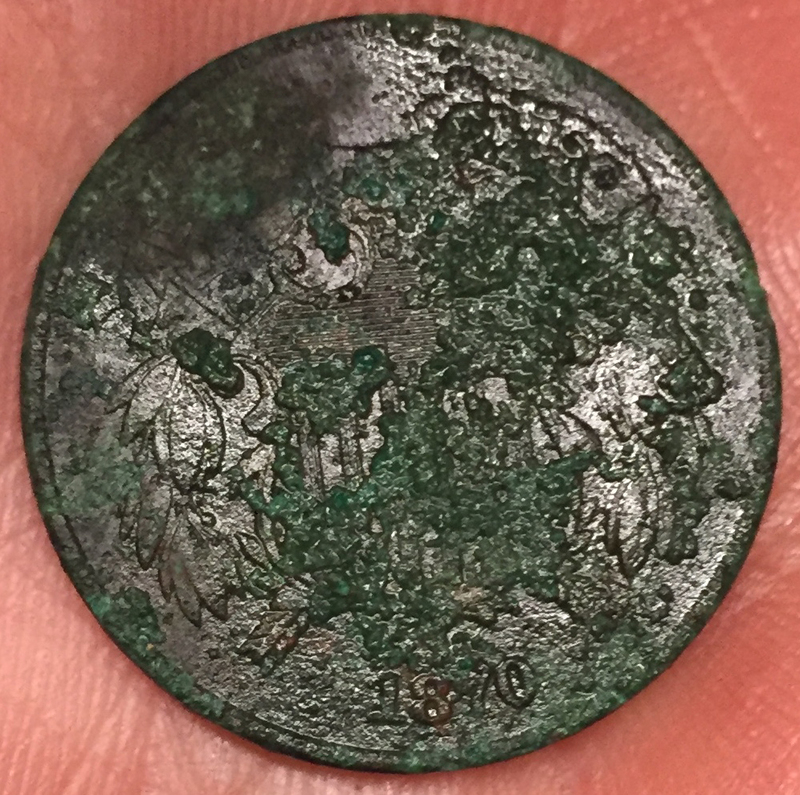 It wouldn’t be until later that I would ID it as a King George II half penny. 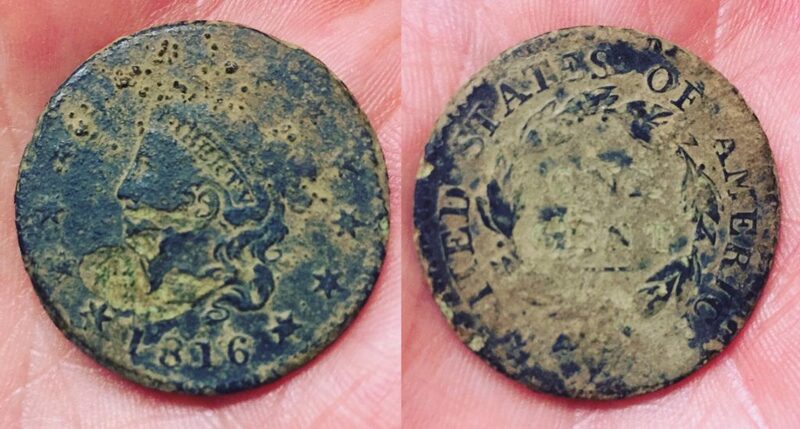 Shortly after that, James found his colonial coin snagging a beautiful 1772 half real. Our two good finds got us very excited and we couldn’t wait to plan a return trip on a dryer day. That dryer day came about two weeks later. Some parts of the field were still muddy, but most had opened up to us. 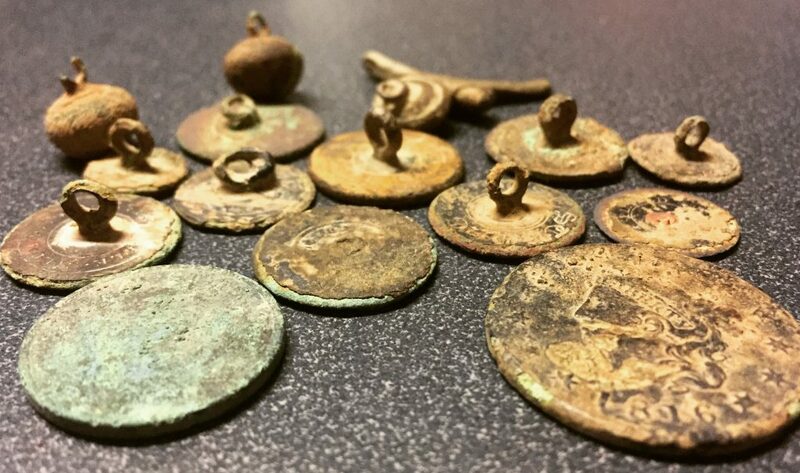 We started on the field where James found his half real and quickly found more flat and ball buttons, Indian Head pennies and horse tack (mostly modern). The horses were very curious and friendly, following us around as we detected. At times, it was a little intimidating. One horse actually grabbed my Deus as if he wanted to find treasure of his own. Luckily I wrestled it back with little effort. Not too long into the day’s hunt, I got a solid high tone. I dug it up to find a thick, quarter sized, copper looking coin. I couldn’t tell what it was. James suggested it was a 2-cent coin, but I dismissed the idea thinking the tone would have sounded lower. But he was right – after cleaning I saw that it was a semi-key date 1870 2-cent coin. Because it’s often difficult to properly ID something in the field, I never throw anything out unless it’s obvious garbage. I found what I thought was a beat up, mangled piece of odd-shaped metal. I couldn’t remove any of the hard-packed dirt from it, so I threw it in my tumbler with the clad I found. (Note to reader: I don’t suggest you put unknown finds into your tumbler as you’ll risk ruining something valuable.) In this case, the tumbler worked great and I was shocked to see that I had found a thimble. I got lucky with that one! Thimble revealed by the tumbler. We wandered onto the adjacent field and started exploring. After about an hour, James found a colonial copper. I then found two flat buttons in the same area. It seemed like a little hot spot so I gridded it carefully. I then got a banging high tone, and once again, dug optimistically. My eyes lit up when I saw a large copper coin – a large American copper coin! I called James over and pointed to what I knew was a large cent. For some reason, I haven’t found many large cents. In fact, I have found more half reals, so this made me very happy. It turned out to be the oldest large cent I’ve found so far – 1816. 1816 Coronet Head large cent. By day’s end we were exhausted. It was a long, hot day of digging and swinging, starting in the early morning. We both had great finds, and that is a key ingredient of a good day. You want to share not only your own good fortune, but in the good fortune of your buds. We both share the struggle, the excitement, the effort, the passion … so we should both be rewarded equally. It’s magic when that happens! Group photo from day two.